Pharma Marketing Blog: Patient Engagement: Who's the Engager & Who's the Engagee? 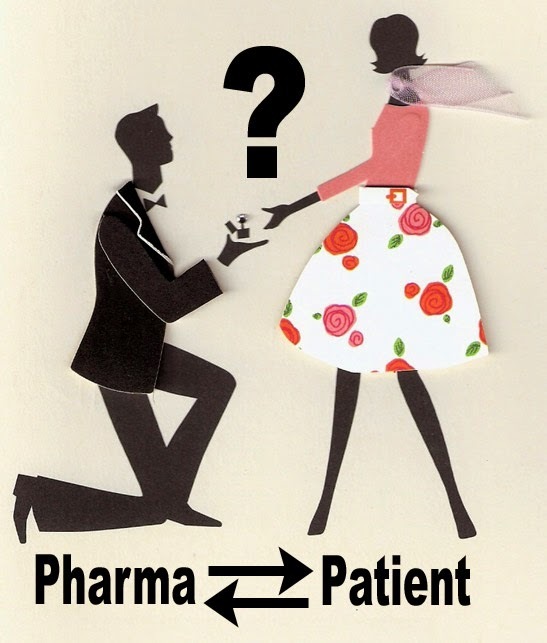 #Pharma or Patient? Patient Engagement: Who's the Engager & Who's the Engagee? #Pharma or Patient? "There is a subtle form of power-politics implied in just about every deployment of 'patient engagement' you're likely to encounter that can serve to deprive the patient of authority rather than promote the autonomy of the patient," says Andrew Spong (here: ‘Patient engagement': a pernicious, presumptive powerplay?). "More often than not, pharmaceutical companies’ ‘patient engagement’ is still done to, not done with patients. It’s small wonder that they fail so often as a consequence. "It remains easy for pharmaceutical companies to enthusiastically support ‘patient engagement’ initiatives as long as they are not required to relinquish their position of dominance as engager. The pharmaceutical industry’s role is not to be the engager, but rather to be the engaged. Activities that genuinely serve the patient should never derive from a strategic plan, but rather emerge as a response to an identifiable, clearly stated unmet patient need. "This orientation is often lost within the industry in the frenzied, headlong charge from concept to deliverable, but is a habit that could be broken simply by taking more time and committing more resources to adequately researching and landscaping unmet patient needs in the disease areas each pharmaceutical company works in." OK. Now for my response. Andrew often takes an anti-pharma marketing stance, which is different than taking an anti-pharma stance. He also uses very big words that might cause most patients and pharma marketers who opt to read his posts to tune out and stop reading before they get to the meat of the matter. Basically, Andrew is saying that pharma must be the "engagee," not the "engager." If you are going to compare "patient engagement" to a proposal of marriage between a man and a woman -- Andrew uses an engagement ring image within his post to suggest this -- then I would think that the "engager" (the man in most cases) is subordinate to the "enagee" (the woman in most cases). That is, the engager is NOT "dominate," but is asking "permission" to be engaged to the engagee with the aim of one day getting married. What pharma marketers want from patient engagement is permission from patients to "woo" them with a delightful period of sharing experiences, information, etc. and ultimately "marrying" them - i.e., getting the patient to take their product as directed by the physician (another stakeholder pharma marketers woo). Hopefully, after the "marriage," the pharma company will continue to support the patient and not participate in extramarital affairs with others -- although we all know that won't happen! In this 3-minute audio snippet, Andrew Schorr, Founder and Host of PatientPower.info, notes that pharma agency accounts come and go, but patients are living with their conditions day in and day out. Pharma has to be careful, says Schorr, when approaching patients about how they view the commitment.